During an event sponsored by the American Association for the Advancement of Science on Monday, October 24, Dr. Gregory Jaczko, Chairman of the Nuclear Regulatory Commission (NRC), defended his March 16 decision to recommend the evacuation of American citizens out to 50 miles from the stricken Fukushima-Daiichi nuclear plant in Japan. It was not the first and likely not the last time the Chairman will have to defend his decision. There is not reasonable assurance of adequate protection of public health and safety. 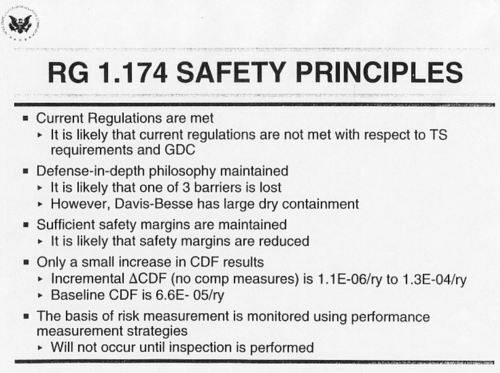 Figure 2 shows the five safety principles guiding the NRC staff in reaching this risk-informed conclusion. All five had to be satisfied for safety to be reasonably assured, but the final two were definitely not met while the first three were likely not met. 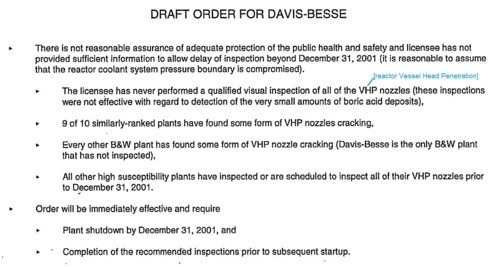 But NRC senior managers rejected their own staff’s recommendation and allowed Davis-Besse to continue operating into 2002. When the plant was finally shut down and the belated inspections finally performed, the situation was far worse than the NRC staff believed. The NRC later determined that Davis-Besse came closer to meltdown than any U.S. reactor since the Three Mile Island accident in March 1979. In other words, hindsight showed the NRC staff to have been absolutely right. When interviewed under oath by the NRC’s Office of the Inspector General, the NRC senior managers who shelved their staff’s shut down order defended that decision. Both stated that they would make the same decision again if confronted with the same facts. They insisted that “absolute proof” was required before they would order an operating reactor to be shut down for safety reasons. Chairman Jaczko clearly applied the appropriate standard in reaching his decision regarding American citizens near Fukushima. After determining that “reasonable assurance of adequate protection” did not exist, he recommended measures to protect those Americans potentially in harm’s way. Others can and likely will debate whether the information available at the time met the “reasonable assurance of adequate protection” standard or not. I am just thankful that the NRC used the proper standard in decisions involving the health and safety of the American public. When “absolute proof” is selected as the standard, the wrong decision has already been made.